Golf sand shots are a must for the golfer who wants lower scores. 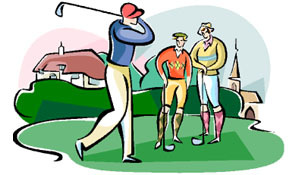 It is the easiest shot in golf because you don’t really hit the ball. Now for the good stuff. The ball position in a sand shot is very important because you must hit as much as two inches behind the ball to get it out of the sand. This is done by playing the ball (ball position) off of your left heel. This is the same place you would tee the ball up for your drive. This position gives you the forward placement of the ball and is a place you are familiar with, so you are not trying to guess about the two inches. Now, you have the ball position straight. You must align your target to the left of the flag when around the green. You may ask why, but trust me on this one. As you lay your sand wedge flat to get the ball up and out of the sand, this will cause the ball to be directed to the right of any target you choose. When you are playing for par the best thing is not to get in the sand. 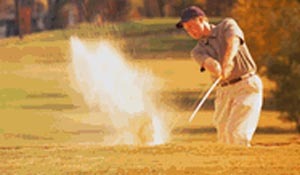 But if you do get in a sand trap, the length of your swing should depend on the carry distance needed for the sand shot. This means that if you need the ball to carry a short distance, then your back stroke should not be too long. But always remember to finish all the way through your swing. This is a common mistake by some golfers, plus it is one that is easily made when you are tired.